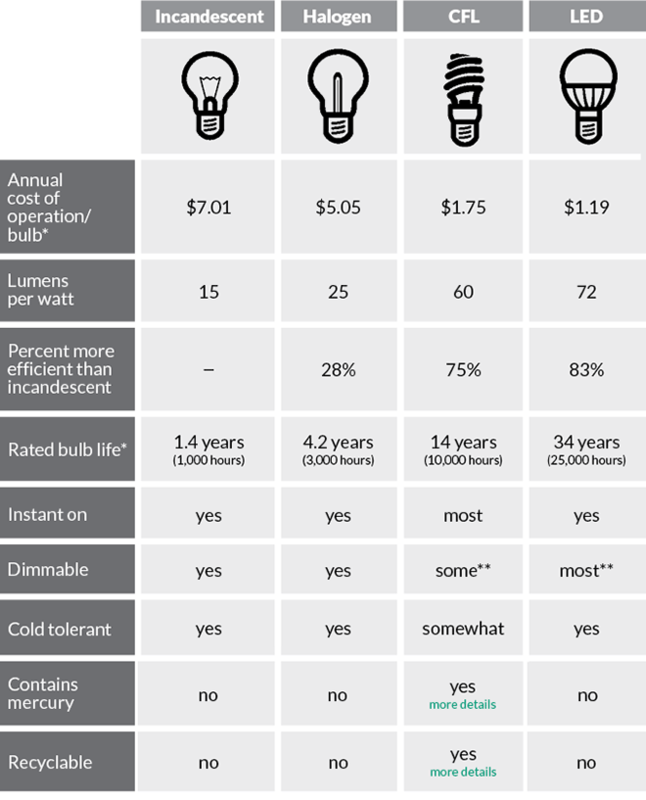 Information on this page will help you compare bulb features, brightness and efficiency, color choices, shape choices, and bulb base choices. We also maintain a list of the best prices on LED bulbs at retailers around Maine. Use this savings calculator to see how much you can save each year by replacing standard incandescent bulbs with energy-efficient bulbs. 1234567891011121314151617181920 Enter number of bulbs Please enter a value for this field. 123456789101112131415161718192021222324 Enter average hours per day that light bulbs are on Please enter a value for this field. * Annual cost of operation based on 800 lumens for 2 hours per day at $0.16 per kWh. ** CFLs and LEDs require compatible dimmers. A-Line (e.g., A19, A21, or omni directional) bulbs disperse light at a wide angle and are ideal for fixtures used to spread light throughout the room. A-line bulbs are a good choice for room area-lighting, reading lamps, and hallways. Spotlights (e.g., R20, BR30, BR40, etc.) concentrate light in a small area to produce a bright spot of light. Spotlights are a good option for track lighting and overhead recessed lighting. Floodlights (e.g., PAR20, PAR30, etc.) cast a wider directional light than spotlights. Floodlights are ideal for recessed lighting, outdoor lighting, landscape lighting, and motion sensors. Candelabra and Miniature Candelabra bulbs (e.g., E11, E12, etc.) imitate the shape of a candle and provide ambient and accent lighting. They are for use in decorative lighting fixtures, including wall sconces, decorative fixtures and chandeliers. Pin (e.g., GU10, GU24) – These CFL and LED bulbs have twist-and-lock dual-pin connectors. If you’re replacing a burnt out CFL bulb, click here to find a recycling location near you.